Whether your son needs help with integers or your daughter wants to practice her spelling, today’s parents are lucky to be able to call on the Internet. But before you turn on the computer and set your kid loose, you should do a bit of preliminary searching with your children to find sites that match their ability level and needs. For starters, what’s the nature of your need for online help? Does your child want to practice math skills or does she need help gathering information and research for projects and papers? “Figure out what the goal is—practice or pushing their thinking,” says Roxanne Farwick Owens, Ph.D., chair of the Teacher Education Department at DePaul University’s School of Education. Once you’ve found some sites that you both like, sit down and work through them together. In addition to being less frustrating for your child, this hands-on approach will give you insight into how your kid’s mind works and how she learns. You’ll see if and where your child is struggling and what the problem might be. Always check the About Us page to make sure it’s a legitimate organization. The more transparent, the more likely it’s a reputable place for quality help. Is the site visually well balanced? In other words, is it filled with ads and inundated with text, or is there a nice mix of images and words? “We see a lot of educational sites that want to deliver so much information that they become overwhelming, especially for elementary school–aged kids,” she says. What type of information is there? Does the site contain only lists of links or is there a way for your child to interact, ask questions, and get responses. Are there tutorials or just Q&A? Be careful of the latter, as just giving the answer won’t help your child learn. “One potential danger of using these sites is that kids do a lot of cutting and pasting,” warns Owens. “Make sure the site requires them to think about the information.” The point is for your child to be walked through the process of figuring out how to do something so he can take steps on his own the next time. Children are helped when they learn how to learn. You should never pay until you’ve thoroughly reviewed the site and its offerings. Ask for a free trial version or demo account so you can make sure the content is appropriate. A lot of online material will engage your child. This is important, especially if he or she is working beyond regular school hours. Many of these sites feature content that is interactive, animated, and interesting. Quizzes can be in a traditional format or in a game format. Sometimes it’s more enjoyable if it doesn’t feel like work, and time on task is one of the keys to learning. Cassandra Barnett, president of the American Association of School Librarians (AASL), tells parents to visit their school’s website to see if there’s a library link. “Libraries have curriculum information as well as links to online encyclopedias, dictionaries, and article databases.” It’s the best place to start, she says, because someone qualified and trustworthy has chosen those links. Barnett says to check your public library, too. Owens is a huge fan of museum websites, calling them a “phenomenal hidden resource, depending on what you are trying to do.” She also recommends professional organizations such as NASA , for any lesson dealing with space, public television stations, or searching for lesson plans on the topic of interest. You can find hundreds of resources and activities by simply searching on particular concepts with your favorite search engine. Another website that can be helpful, according to Sowar, is YouTube. “This site has developed a not-so-good reputation, but don’t let that fool you,” she insists. “There are thousands of videos posted by teachers, lecturers, and other educators explaining specific concepts.” For example, searching on balancing chemical equations yields 3,540 results. Most of these are two- to 10-minute video clips of lessons by teachers, students working out problems, tutorials, animations, and applications to real-world situations. If you can’t find the right site for you child, send an email to We-FLI: Web-enhanced Family Literacy Initiative and they’ll find an expert to answer your question and post it as a video podcast. 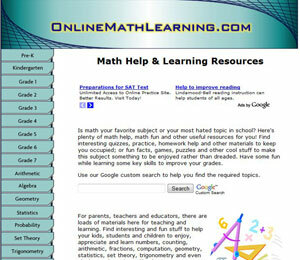 This site offers a terrific mix of video tutorials and web resources for grades K–12, covering math, science, English, social studies, technology, and other subjects. Kids see and hear but have to do their own processing. Each video, which is two or three minutes in length, focuses on such skills as adding columns of numbers or learning about different species of birds. The interactive activities reinforce newly acquired skills, like a virtual lab that lets students figure out how changes to land will affect fish in a pond. From education company Pearson, this site is a great spot for looking up facts and background information. It’s organized by subject (history, language arts, math) or skill (research, studying), and also has quizzes and slideshows. For instance, drill down into the social studies section to read up on national anthems and the U.S. Constitution, or take a quiz on First Ladies or the Bill of Rights. The Fact Monster section—for younger kids—offers information, games, and quizzes. Whether your child needs help with astronomy, current events, word problems, or music, she’ll find it with this site’s Rapid Research section, in which kids recommend good resource sites to other kids. 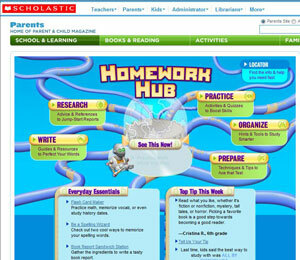 Each area, such as technology and computers, offers a list of links with write-ups from other students that showcase that site’s offerings. It also features a terrific section on writing papers, with step-by-step articles on writing a compare-and-contrast essay or a research paper. You can download a model paper, an idea organizer, and a checklist to make sure your paper is complete. The writing section also has Q&As with TIME editors on beating writer’s block, handling revisions, and more. Children in grades one through seven can sharpen their skills with activities and quizzes, research tools, articles, and study tips. From fun games to encourage skills practice and tips for memorizing spelling words to advice on creating flash cards, this site has something for everyone. 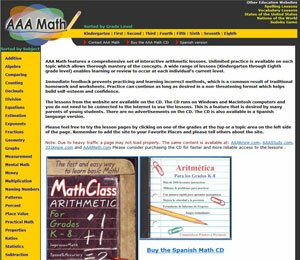 Math lessons, sorted by subject, for grades K–8. Kids can get help on such common topics as measurement, patterns, graphs, and fractions, and then practice what they’ve learned. Each section is broken down into subtopics that describe the concept, with related lessons to give students practice. Next, students get to practice what they’ve learned and check their answers immediately and then play a game to confirm their understanding. Math help, quizzes, practices, fun facts, puzzles, videos and games to make numbers, counting, fractions, statistics, and the rest of it enjoyable. The companion site, Interactive Zone, lets kids create worksheets with auto-scoring, play games, or do simulations for more practice. Stumped about how to explain proper usage for “nor” versus “or”? 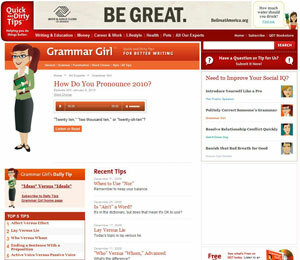 Get help from this site, which contains full explanations on grammar, word choice, punctuation, or style. Answers are explained succinctly and efficiently—often via audio. This site also provides information to improve writing skills. 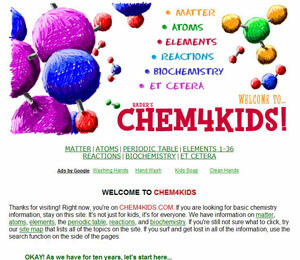 Learn about basic chemistry, including matter, the periodic table, reactions, and more, from Andrew Rader Studios. It’s very text heavy but the explanations are well written and accessible. After you, er, your children, read up on a topic, take a quick quiz to see if it’s been tackled. Thanks for the post! My daughter is struggling at school for the first time and I need to know how to parent to her changing needs. This provided some good resources!